Branson...It's Just a Quick Zipline Away! 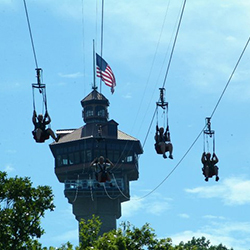 Obviously, you can't really zipline into Branson, but zipping around the area is easy! Zip here, zip there, zip just about everywhere, because Branson has several zipline operations, each one a little different from the other. Almost every destination seems to have jumped on the zipline craze, but Branson's variety of zipline experiences rises above the rest! Zip and Zoom from Branson's Highest Point! 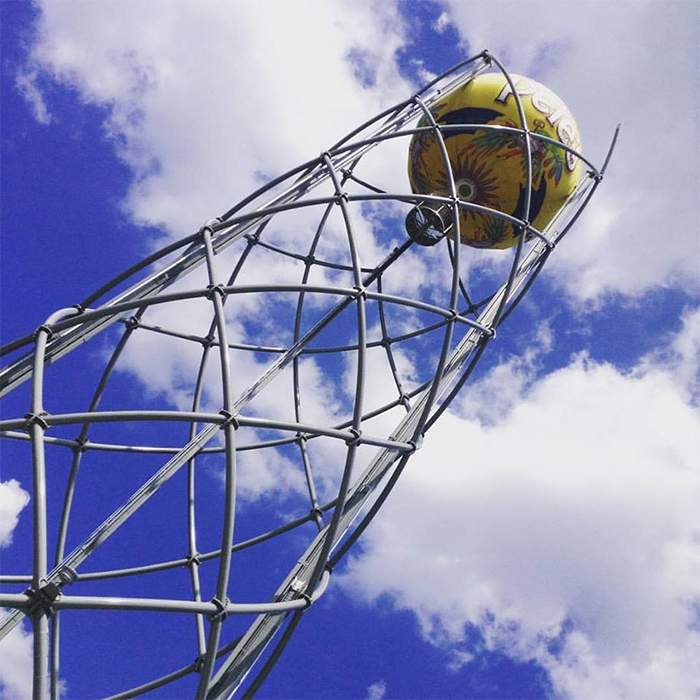 The Vigilante Extreme ZipRider at the Shepherd of the Hills Homestead stands high above the others; literally...it launches riders down from a height of 170 feet at speeds up to 50mph! Located near the top of Inspiration Tower, the Vigilante doesn't require a lot of rigging or harness fitting, or a long list of riding instructions, there's only the thrill of flying through the air, safely secured in a cozy seat. Designed to automatically brake as it descends cable gradients between 5% and 40%, and to slow to a stop at the bottom, guests can just breeze through the fresh mountain air and enjoy the trip! You'll zoom down over a mile and a half, and then take a scenic shuttle ride through the homestead back up to Inspiration Tower. Because four riders launch side-by-side at one time, it's easy for a family to zip together on the Vigilante. Make sure you save a little time to enjoy the stunning panoramic view from Inspiration Tower, it stands 230 feet high and, on clear days, you can see as far as 90 miles away! Get 350' Closer to Heaven! 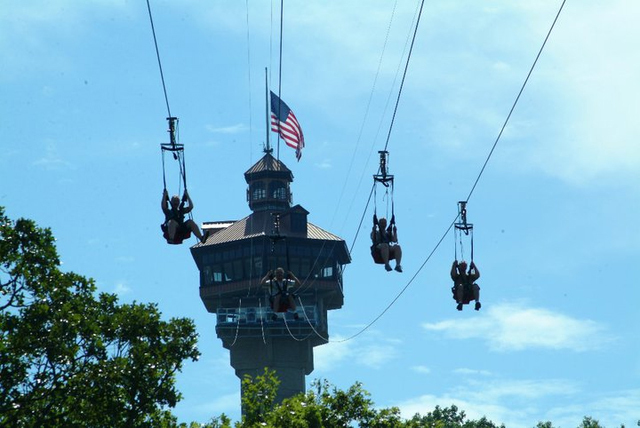 Zip Line USA offers one of the Branson area's biggest thrills...zipping along way above the forest floor! Soar your troubles away! In lovely Reeds Spring, just a few miles from Branson, a place of adventure, nature, fun, and excitement. Both beginners and experts start out on the Bunny Hop cable to get warmed up and ready to soar! Then move on to the Mountaintop to Mountaintop cables, flying high above the treetops. 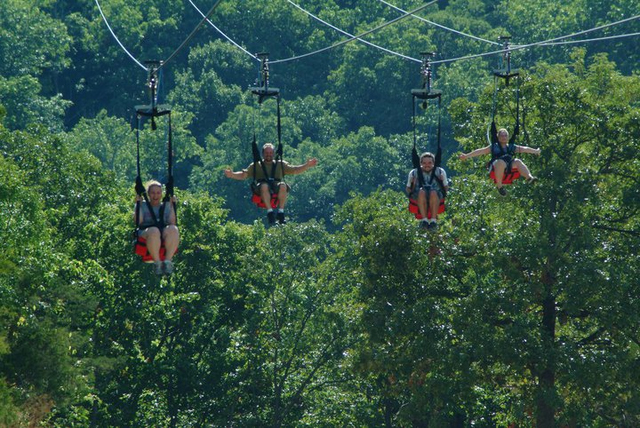 Branson area's ONLY true zip line canopy tour! 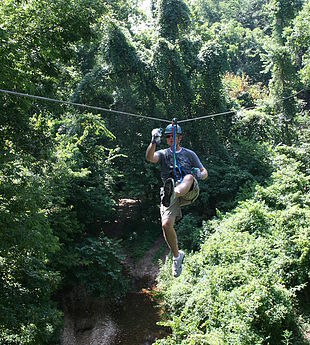 While soaring through the forest canopy you will experience a feeling of being one with nature. Each adventure will begin with an exciting 4x4 bus bringing all to the top of the course. So, NO TOWERS TO CLIMB! 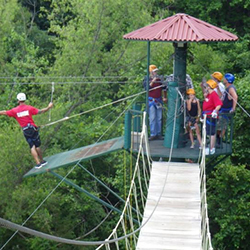 Branson Zipline, located just north of Branson on Highway 65, is an eco-adventure that features several different experiences. The 2.5 hour Ozarks Xplorer Canopy Tour: 7 zip lines, 10 suspension bridges, and the Dynamite Drop; an exhilerating 40 ft freefall! The 1.5 hour Flying Prospector Canopy Tour: 4 zip lines & 7 suspension bridges. 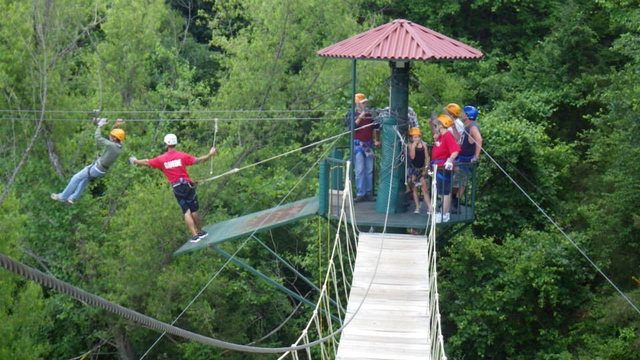 The 3.5 hour Canopy Adventure Combo: 8 zip lines, 10 suspension bridges, and an unforgettable zip from the 100 ft tower. For the ultimate thrill, the Blue Steak Fast Line & Free Fall Xpress: Step off the 100 ft platform and experience "freefall." There are also non-zipping adventures like the Wolf Creek Photo Safari and Ol' Blue Gemstone Mining. For more information on the Branson Zipline, Vigilante Extreme ZipRider, or Zip Line USA, give us a call at 1-800-785-1550 Web Code: BTC; we're also happy to get your tickets reserved for the time of your life! 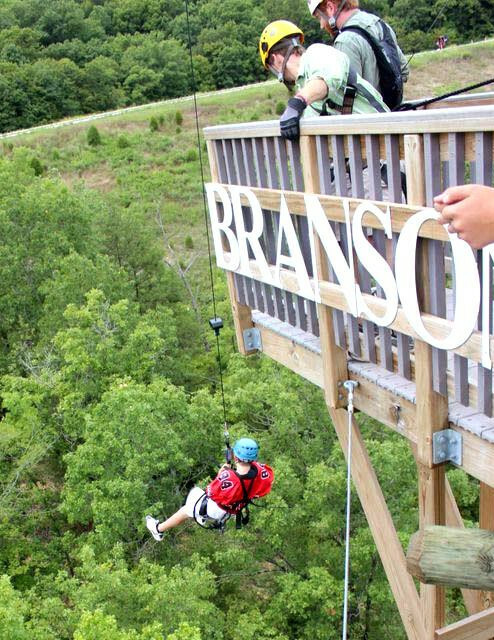 More Branson Zipline Excitement Awaits! 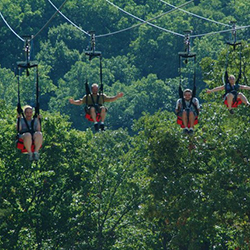 Adventure Ziplines, the attraction that lets you zip right in the heart of Branson! The only zipline attraction located within the city limits. Seven different dual cable, steel-constructed ziplines up to 2,000 feet in length reaching speeds up to 50 mph. 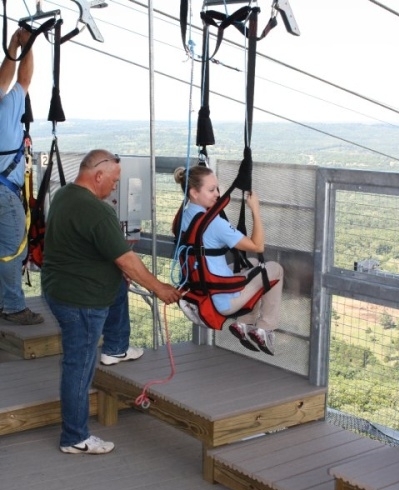 Indian Point Zipline Adventure Tours is located just outside the city limits on this beautiful Table Rock Lake peninsula, the popular resort area where Silver Dollar City is located. Six ziplines employ a sitting harness trolley system that'll take riders 2,700 feet through the Point's forest land. You'll also discover the Indian Point Hyrdoslide at the same property. 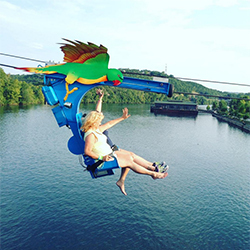 Parakeet Pete's Waterfront Zipline at Branson Landing utilizes a proprietary seat system that keeps you securely strapped in, but harness free. Sit down, glide along, and enjoy the scenery of Lake Taneycomo and Branson Landing. 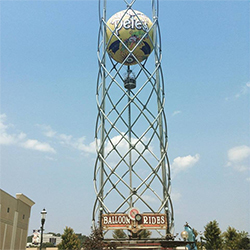 Parakeet Pete's also operates the Steampunk Balloon Ride, where you can enjoy a 360 degree view high above the lake and the Landing. For breathtaking zipline adventures that are, at once, family-friendly and offer something for the thrill seeker, you won't find a better destination than Branson...it's the ultimate "zip trip!"